NASA's Lunar Reconnaissance Orbiter captured this stunning image of a lunar crater on Nov. 3. The moon is pretty enough here from Earth, but it's even more stunning up close, as this new photograph from NASA reminds us. The image was captured on Nov. 3 by NASA's Lunar Reconnaissance Orbiter, which has been circling the moon since 2009. While the crater itself is not quite so young, it's still pretty fresh — it formed less than 100 million years ago, the spacecraft's camera team said. "Look closely at this crater. Some might say they see a hole in the ground," representatives of Arizona State University, which runs the three cameras on the Lunar Reconnaissance Orbiter, wrote in a statement released with the image. "Try to see it, however, as [Neil] Armstrong saw the Moon" — with "a stark beauty all its own," as the astronaut said during his historic moment in 1969. 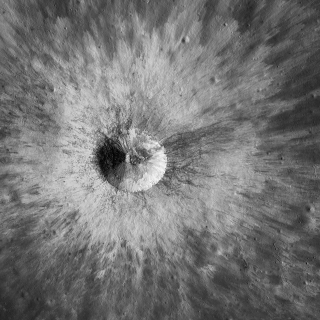 The crater is a little over a mile (1.8 kilometers) across and is along the wall of a larger, older crater, called Hedin, on the west side of the moon close to the region where the near and far sides of the moon meet. Dark streaks radiating out from the crater mark late-stage ejecta that landed at the end of the impact event, according to the statement. You can zoom in on a high-resolution version of the image on the Lunar Reconnaissance Orbiter's website.